Consider donating to the Midwives' Association of Washington State! All childbearing families deserve safe, respectful, and high-quality care that empowers and supports them throughout pregnancy, birth, and early parenting. The Midwives' Association of Washington State (MAWS) is a unified, trusted voice that works with legislators, midwives, and other professionals to fully integrate midwifery into the health care system in Washington so that all healthy childbearing people can have access to this kind of care. We are currently fundraising to support our upcoming Conference in April 2019. MAWS hosts an annual conference for midwives, doulas, nurses, doctors and other birth professionals. Our diverse speakers are professionals in their fields, bringing you the latest research and relevant information. 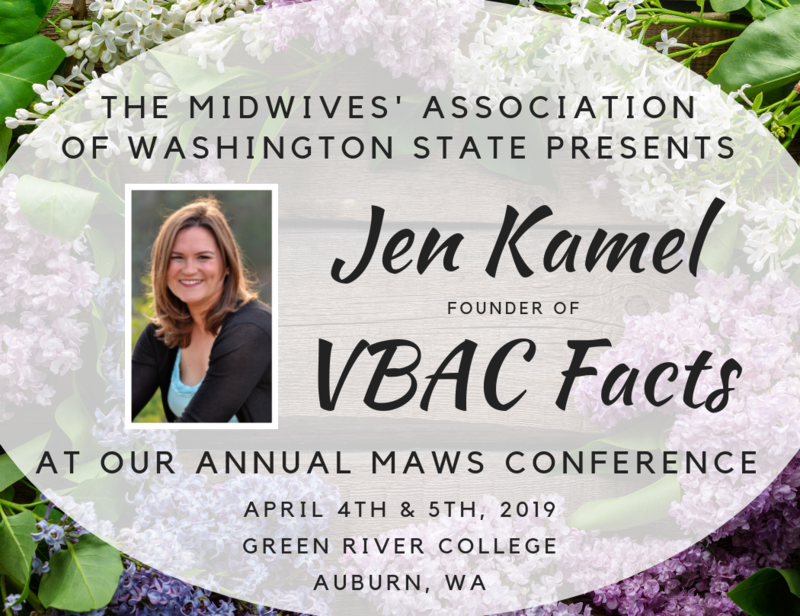 This year we are thrilled to host Jen Kamel, the founder of VBAC Facts. Your donation will go directly toward her speaker fee. Any amount helps, no matter how large or small. We appreciate your support! You can donate with this form or Venmo us @washingtonmidwives. Learn more about our 2019 Conference here. Work with state agencies to make sure that you have choices about where and with whom you give birth, regardless of where you live, and whether you have private insurance, state insurance, or no insurance. Your midwife has given you so much -- this is one way to give back! Help us ensure that all families have access to high-quality midwifery care. Thank you for your support of MAWS! Please consider becoming a supporting member if you are not already. Donations are not tax-deductible: because advocacy is central to our mission, MAWS is a 501(c)6 non-profit. This field appears on membership card. Your email is the unique identifier for your profile. It cannot be used twice.